Where has Dawn's Early Light been? Why hasn't Bill Rice answered any email? Why should I keep reading? All very good questions. First, let me start with an apology to those who used to regularly read the blog. I am very sorry to have just stopped writing with no updates, no information, and not even looking at email since December 14, 2005. Since my last post, Catherine, Mom and Dad have been to London, Qatar, the California Coast, Seattle and various other cities. I stopped blogging because I had realized that quality posting took a great amount of time (at least an hour for research and an hour for posting, not including the regular news-junkie reading all day long). While I was not a great economics student in college, I did latch on to the concept of opportunity cost. There are four driving forces in my life: God, family, friends and work. Work took up more time towards the end of last year until recently, though I have traveled much on short trips. To sum up in pictures why I have been gone, here is a dear and special one, my lovely Catherine. 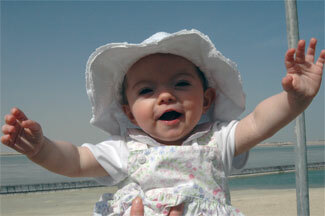 She is almost a year old, and in her 11 months has flown on 11 flights, 6 internationally, and is a first-rate traveler. 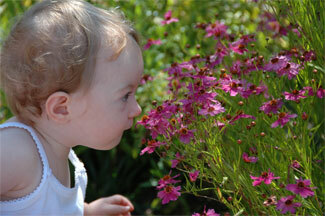 This is Catherine enjoying her independence and smelling the flowers in our yard on a wonderful July 4th. 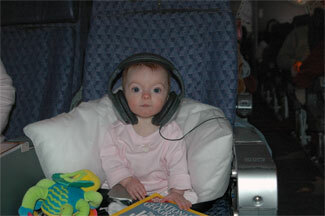 Here is my world-traveling Catherine en route to London in February. 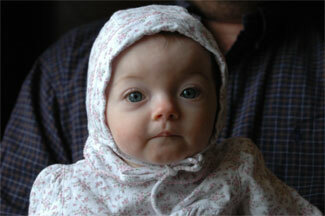 Here is Catherine in London warmly dressed being held by Dad. From cold London in February, off to Qatar, where we saw two very special friends of ours plus my best friend, who was deployed in Doha until April. He is a Weapon System Operator in an F-15E Strike Eagle. Qatar was a fascinating trip and gave me a new insight into the Middle East, both the positive and negative, in comparing it to Western civilization. 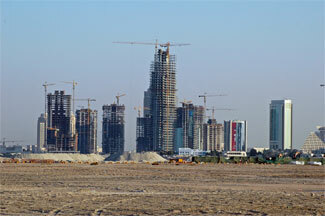 Doha, the capital, is under massive reconstruction, made possible by Qatar's natural gas and oil wealth. We also recently said goodbye to the last of my grandparents, Mildred Rice, who at 93 had lived a great and purposeful life. Over 100 people said their goodbyes to a woman who lived in China, Japan and Taiwan and cared deeply about sharing God's love to the people she met. 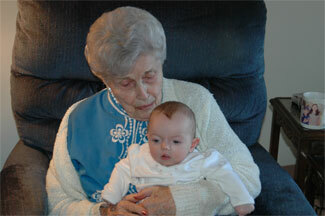 Here is a photo before her passing, with Catherine. But spending time with Catherine and Mom at the beach is one of our great loves. 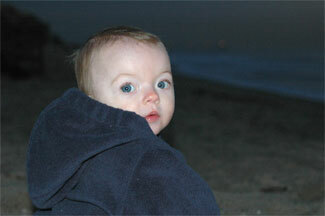 Here is Catherine some months ago taking in dusk in San Clemente, California. While these photos don't excuse my disappearance, hopefully they can convey the joy I have in being with my family and why working hard to create more special times and travels with them is so important to me. I want to write again, but I know that I will not, for some time to come, be able to write daily. Over the past several months I have wrestled with how I can blog about the foreign policy and political ideas I am passionate about and still give 100% to my family, friends and work. The balance probably lies in less posting, but not putting my head in the sand and ignoring it completely. There are many ideas that I want to explore further. I live in a blessed country, with a terrific family, and every day I thank the Lord that I can live the American dream. On this 4th of July, I want to especially thank those in the uniform defending the liberty that my family enjoys. Wow, she is averaging 1 trip every month of her life. Very impressive. She is really moving around! You are talking about the independence day, right? Anyway, good photos you made.